We understand your need as a health care facility to operate efficiently while providing a healthy and safe environment for your residents, workers and building occupants. Our sustainable green housekeeping and Restroom products & services are designed to help improve your indoor air quality and the health, safety, and environmental impact of your facility. We also offer a complete facility maintenance program that focuses on the water quality in your HVAC systems, and maximizing the efficiency of your water treatment program to reduce water and energy use. We can also help you pursue LEED® certification for your facilities with ourCertified Green Housekeeping Professionals. And, RMC provides cleaning programs for food service areas, outdoor parking facilities, and transportation vehicles. 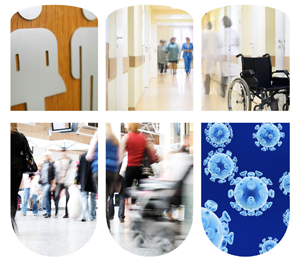 Rochester Midland is your single source for Health Care Facility and Environmental Services needs. Click below to learn more.